The conclusions the audience might draw from Demetriou’s documentary as a whole and the spirit of these last spoken words crystallize the key ideas in this paper. That is the relevance of space and time to the Cypriot nation, and their representation in cinematic space, through the reading of Lia Lapithi’s cinematic shorts. I will not say more for the present moment to unravel how time and space gain their significance in these texts and context, because my textual readings will address these questions. What I would like to draw attention to before moving on, is the reference to time, evoked in the expression of Cyprus as a nation expanding. Coming at the moment when a Christian Greek Cypriot enters the space of a mosque, the audience is compelled to consider the complexities implied in the reference to nation in relation to history, time and space. Demetriou’s film captures a sense of a ‘before’ and ‘after’ in Cypriot history and society. And this is where Deleuze’s work comes in. · the invitation to engage with the predicament, even sense of crisis at play when individual time and public time are seen to compete and therefore to become challenging in the study of the national context. It is with these aspects of the nation’s time, and its representation in film that Deleuze offers a starting point, with scope to extend his theories beyond the context in which they were originally intended. Finally, it is in Deleuze’s interpretation from Cinema 1 to Cinema 2 where he delineates a transition from movement images to time images, explained in terms of a significant historical transformation, that he invites a fertile interpretive framework for the present Cypiot context. In the cited documentary the time evoked by ‘before’ and ‘after’ is vital in Deleuze’s thesis as it is located in a pre and post European society after the Second World War. I begin by offering an overview of both Cinema 1 and Cinema 2. After reviewing some possible limitations and criticisms of Deleuze, I move on to three cinematic texts by Lia Lapithi. (historical explanations not chronological). Gilles Deleuze’s Cinema 1 The Movement -Image which originally appeared in 1983 and Cinema 2 The Time -Image published in 1985 bring a philosophical, even radical discourse to Film Studies to explain how time is represented through two cinematic images: the movement -image and the time-image. Deleuze’s dense concepts, interact with familiar cinematic terminology, as for example in his explanation of the way camera shots correlate to different images in the frame, and this is one of the sustaining aspects of his work. Cinema 1 contains a substantial commentary by Deleuze of the French Philosopher Henri Bergson’s Matter and Memory, which he utilizes to explain the connection between cinematic images and movement, and also the construction of time and narrative. Deleuze explains how the camera produces movement and thereby creates an impression of continuity. However, he argues that this movement is a ‘false movement’ because the movement image represents a journey through space to construct a narrative which is continuous and extends forward. Therefore there is some kind of illusion of movement which creates a false sense of continuity (1983: 1 ). Deleuze sees the camera as analogous to a means of transport, with the camera moving from one space to another as it moves from frame to frame. In this light he describes cinema as ‘ the system which produces movement as a function of any-instant-whatever that is, as a function of equidistant instants , selected so as to create an impression of continuity’ (1983:4). His reference to the equal space or distance between these frames explains the dynamic of the kind of cinema with which a fair proportion of contemporary Hollywood represents today; and that is the high concept, action packed blockbuster. Deleuze explains in his ‘First Commentary of Bergson’ (Cinema 1) how each movement from shot to shot and frame to frame is a transaction in space where the individual parts of the system (the set) are seen to decompose as they move from one frame to the next to recompose the image. Movement is distinct from the space it covers and it cannot be divided without altering the quality of the space each time (1983:1). He explains that ‘each time we find ourselves confronted with a duration, or in a duration, we may conclude that there exists somewhere a whole which is changing, and which is open somewhere’ (1983: 9). The crucial aspect here for the cinematic image in Cinema 1, is the continuity and movement. Once we start however to view the set as a system where competing parts are seen to destabilize the whole, or as with the sound image to realize that it might remain ‘beyond movement itself’, we begin to anticipate the stillness of the time image- and this is a key focus in my textual analysis. Deleuze explains that this is because, whilst a frame is composed of a number of parts, these ‘do not have a common denominator’ (1983: 14-5). For example there is no common standard between light and sound, therefore movement precipitates a destabilizing effect on the parts of the set and alters their proportions. When the movement in space takes place, begins to vary the different elements within the set it allows for the whole set to be open and to experience a becoming from decomposition to recomposition. Movement will always relate to change, and this change will perform a qualitative change in the whole frame (1983: 23). Delezue gives the example of sugar- which dissolves in the glass of water to alter the material substance of this water. § and the action image through the medium close up. During the classical period of pre-war Hollywood cinema the predominance of the action image is defined as a motor-sensory image. This is characterized by the ability of the protagonist to move through the narrative because he/ she is able to influence their actions. The motor-sensory image works because there is a schema which determines that an action is followed by a situation which precipitates a new situation and this is because of the protagonist’s reactions to situations which produce new situations and so on. In this sense, the impression of continuity is sustained through the camera’s movement into the next frame, creating a sense of a linear narrative for the audience. In Cinema 1, the indirect representation of time – upheld as we have noted, is through ‘false movement’ is made feasible by continuity editing. Because the totality of the cinematic image is lost it now becomes possible to refer to a space inside or outside, made possible through the separation of the optical image from sound, situating the first in and the second outside of the cinematic frame. This disassociation of sound and image is a new development of the time image which is the focus on Cinema 2. And either sound or the optical image, or both are never ‘induced into action’ they just make the audience pay attention (1985:18). And now time is represented directly, purely for itself as it subordinates movement to emerge ‘in its pure state’ creating a circuit around the image rather than extending into movement (as the action driven image would) (1985: 17). As the image splits different layers are formed around the direct- time image. The gap in time is not filled by movement but through recollection. Delezue argues that the past is made at the same time as the present and a split in time forms a virtual image in the past, whilst the other is ‘launched’ forward into the present (1985:81). The past is not a pre-existent place, but it is made in the present. When a crisis such as war suspends action and movement, time emerges and recollection is about locating the former present which was. This is the Bergsonian idea of time constantly splitting, to form a present which passes and a past which is preserved. The significance of the time-image is that the suspended time between frames has now created the notion of an inside and outside space. As time cannot be linear, this means that individuals inhabit time and become internal to it; they can move in time and change it. Deleuze argues that duration is subjective and that it constitutes our inner life, making time non-chronological. (1985: 82). Before turning to the texts I want to be provocative by confronting all the possible reasons why Deleuze is a very unlikely way of approaching Cypriot cinema. He is a Western philosopher, an elitist French – specifically Parisian scholar who even spoke with disdain about popular culture. David Martin Jones informs us in Deleuze, Cinema and National Identity: Narrative Time in National Contexts (2006), that Deleuze’s work has possible limitations if we take on board that he drew almost entirely on Western European Cinema and American Hollywood cinema as his case studies (some references are given to Japanese and Soviet directors). From this, Deleuze sets up a binary. In Cinema 1 he focuses on the popular genres of American (Hollywood cinema) when he defines the movement image (as characteristic of pre-Second World War cinema). Then, Cinema 2 is all about the emergence of a time-image after the war in the creation of Art Cinema, which is European- but specifically Italian, French and German. As Martin-Jones very convincingly explains, Deleuze’s paradigm simplifies both pre and post war film production. In fact, it becomes Deleuze’s strategy to suggest a logical transition from the movement to the time image (using this model) thereby as Martin-Jones explains choosing to ignore a lot of post-war cinematic trends such as the Italian westerns which were not time- images, had a popular appeal and do not follow his pattern. Nevertheless, for the reasons stated at the outset and with the above arguments in parenthesis, I want to draw on the distinction which Deleuze identifies in cinematic practice, of a movement image, superseded in the mid-twentieth century by a time-image, precipitated by historical events of huge proportions. Lia Lapithi is a filmmaker and a multi-media artist who lives and works in Cyprus . Her short films are only distributed on her website and can be described as unruly in their abstractness, their experimental quality and their hostility to narrative. All of her experimental shorts are political in the sense that offer a dimension to the national ‘problem’, which has occupied journalists and scholars . After nearly a century of British Colonial rule commencing in 1878, independence was gained in 1960. During the colonial years the two dominant populations, Greek and Turkish Cypriots (80 per cent to 20 per cent of the population) were polarized as communities, as the new administrative system required them to represent themselves separately (Bryant, 2004). Ethnicity and religion were the two aspects which determined that by the year of independence there had already been bi-communal strife, as well as the evolution of two distinct nationalisms and national identities, precipitated by an increase in literacy, the rise of the press in each community and education. Greek Cypriot nationalism looked to mainland Greece and aspired to a union with the ‘motherland’ with whom it shared a Hellenic culture, education and the Greek Orthodox religion. Turkish Cypriot identity was shaped by a mainland Turkish nationalism created by the construction of a modern Turkish state which Kemal Attark had forged after 1923. Intercommunal violence in 1958 and then 1963 divided the communities with a ‘green line’ in the capital Nicosia. This hostility continued until 1974, which created a permanently divided island. As I now shift to a textual focus I would like to indicate the schema I follow. Rabbits have no Memory draws the audience’s attention to levels of time as underscoring her cinematic composition and use of space within the frame. Then, I move on to a‘Grade IV’: I do not Forget, which is saturated with ideological messages which deconstruct the national homogenous discourse; and in particular the link between education and nationalism. In so doing I apply Homi Bhabha’s ideas, to suggest ways of reading Lapithi within her own historical and national context. Finally, in Electricity, I want to present how time comes to emerge purely for itself through the sound image . Whilst I draw significant ideas in this case from Deleuze I also turn to the work on Intercultural Cinema undertaken by Laura U Marks. I also draw on the revisionist work on time and narrative offered by Martin-Jones in order to connect time within the text, and the nation. It can be argued therefore that overall my plan is to begin with the notion of a space which equates to the empty frame, to focus on time and history and then to sustain this argument by explaining how the sound image assumes a dominant part in cinematic time and space. This text suggests a Deleuzian post war debris which marks his conceptual shift from Cinema 1 movement, to recollection and stillness represented by the time-image in Cinema 2. Lapithis’ s black, blank screen functions as her ‘any-space-whatever’ signifying her hesitancy to fill this space, whilst reminding us of what Deleuze’s explains early in Cinema 1about the uniqueness and emptiness of the frame which achieves the ‘highest degree of rarefaction … when the screen becomes completely black or white’ (1983:12). A rarefied frame, decomposed of its parts, can perform a radical transformation precisely in the becoming which re-composition presents; and as such in re-proportioning the cinematic elements to bring a new emphasis and meaning. Such anticipation suggested by the empty space captures a post war mood of perplexity which Lapithi has confronted through her resistance to narrative contiguity. The white lettering of the titles begins to fill the blank screen and then the abstractness appears in the form of a roulette table and the distinct sound of the spinning ball. Her ambience is a casino reflecting what she intended when she described her work as ‘enigmatic, abstract, a puzzle to be decoded’. Underlying this image a white rabbit emerges, but it is out of focus; accenting a sense of ambiguity. There is no continuity between these two separate images to connect into a narrative and we are thus reminded of the jump cuts and irrational editing which characterized the French New Wave, such as Godard’s films, which Deleuze describes in Cinema 2(1985: 9). I interpret this abstractness and disjointed narrative in the terms of Bazin’s ‘floating events’ which referenced the post- war European landscape (1985: 1). What Bazin implies in this context was the backdrop of physical chaos accentuated by a moral vacuum and a crisis of knowledge. All these characterize Cyprus, post 1974. Lapithis’ white rabbit represents the Cypriot people whom Durrell described as ‘happy childlike innocents, misled by ‘demagogues’(Website, Rabbits: 2006). Her title is a direct response to Durrell’s colonial sentiments (which Lapithi deems patronizing), based on his experience of living in Cyprus during the 1950s Silence and stillness are followed by another blank space. Then she brings the image of the rabbit into focus before locating it in the middle of her frame building on the incongruity of her previous shot and underscoring the dislocation of her anti- narrative. As the rabbit is pushed to the right of the screen she now introduces an additional ‘floating event’ in the form of a road sign. It reads: ‘Refugee Housing. Anthoupolis’. This abstraction is coded because the colour of the sign emerges as representative of the post- 1974 landscape. It has become familiar in this desolation for providing directions to the refugee housing. Whilst our gaze on the left side of the screen represents this familiar scenario we apprehend it as unfamiliar because of the preceding frame with the casino and because we are distracted by the image of the rabbit, which is pushed to the right hand side of the screen. As Cypriots on both sides were displaced from their villages, Greek-Cypriots were relocated almost entirely in the south, and Turkish-Cypriots in the north. Government funded housing projects were set up in Nicosia and Larnaca. Anthoupolis is a suburb of the capital Nicosia where many Greek Cypriot refugees were re- housed. As the screen splits there is equal proportioning of her cinematic elements within the space of her frame, locating the sign for Refugee Housing to the left, and the white rabbit to the right of the divided screen. We see both simultaneously at eye level with a symmetrical equilibrium which aligns historical events to suggest a connection between time and history: the civilians of the 1950s and life in Cyprus after 1974. As text is projected from the left to the right side of the screen, the split screen is sustained. Durrell’s text appears reading: ‘It was unreal. One has seen rabbits scatter like this at the report of a gun, only to emerge after half an hour and timidly come out to grass again unaware that the hunter is still there watching. Civilians have no memory. Each new event comes to them on a fresh wave of time, pristine and newly with all its wonder and horror brimming… ‘. Lapithis elliptical style does not directly connect the two images but through the stillness, abstraction and the hidden gaps of history she begins to draw them together. She references Cypriot history as the population has endured a succession of rulers : Lusignians , Venetians, Ottomans and British Colonial rule. Lapithi directs her irony at the collective amnesia of Cypriots who are credulous to endure successive rulers to their detriment. Lapithi presents a ‘puzzle’ to be ‘decoded’ through her juxtapositions. A red banner in the text breaks with her neutral colours and suggests something alarming as text flashes across the screen. Capturing the arrival of the time-image suggested by the stillness of the rabbit, Lapithi represents the preservation of time in the past, rather than the present which passes and references the Bergsonian notion of time splitting, found in Cinema 2. As the spectator turns their focus on the left side of the split screen, movement is intimated in time and space through the array of camera shots: panning, medium and close up shots, shots which lose their focus . However, with movement to the left, and stillness to the right, we gain a heightened sense of time visually, with the rarefication of her frame which is saturated by levels of duration. As the frame composes a sense of horizontal space and simultaneous time from which tension is created , Lapithi’s double time in her split screen amplifies a crisis in the time of the nation. I would like to superimpose Bhabha’s theory of time, found in ‘Dissemination: Time, narrative and the margins of the modern Nation’ (1994), which offers a challenge to Anderson’s ‘homogenous’ and simultaneous time for the nation as found in Imagined Communities. If we begin by noting that Deleuze’s ‘classical’ period of cinema is pre Second World War then we remember that the action –image, realized through the medium shot was about sustaining a linear narrative. The historical break in his thesis represents the unsustainability of this continuous narrative as action was now subordinated to time. In Bhabha’s terms within his theory of time and history in a postcolonial context nations carve out a progressive movement of national history, upheld through links between ‘cause’ and ‘effect’, whilst they narrate the present on a past they have returned to. He explains that the ‘nation’s presence is distracted by the presence of the past in the continuity of history and also its link to the future’ (Bhabha, 1994: ) Writing the nation becomes a self justifying process in perpetuity to define the present and if necessary to rewrite the past. But this cultural practice, which Bhabha terms ‘pedagogical’ is to present time and history as linear. Official culture and official histories are sustained in this ‘pedagogical’ way but the ‘doubleness’ which Bhabha describes within the time of the nation emerges through the performative practice of minorities and marginalized groups whose voices emerge as a cacophony for the homogenizing of official narrative. These voices disrupt the pedagogical history and forcefully assert that time is circuitous not linear. Bhabha expresses this as an antagonism not with other nations but a ‘split’ within itself ‘articulating the heterogeneity of its population’ (1994:12). I see this double time as suggesting an interiority to time, which Deleuze explains in the existence of time and space within and outside the frame in Cinema 2. Such a split in Bhabha’s terms amounts to a contest for the ‘narrative authority’ between the performative and the pedagogical (1994:12). As minorities go back to the ‘origins’ of the nation their part in the nation’s origins reveals an absence in the grand narrative of the nation. I would therefore argue here within my own context and textual study that Bhabha’s terms of ‘pedagogical’ and ‘performative’, crystallize the crisis of the movement image in its deference to time whilst his terms of the ‘pedagogical’ and the ‘performative’ are translated to this text. 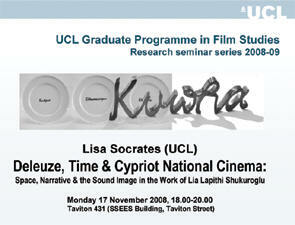 The result of this alignment, captured in the split screen and the antagonistic view of narrative in Lapithi’s text, helps to explain in a new cinematic and cultural context what Deleuze laid out in his thesis and can now be extended to Lapithi’s national context, cinematic time and the representation of the time -image . If ‘Rabbits have no memory’ it is possible for pedagogical histories and cultural practice to be sustained and this is the crisis which Lapithi captures; almost a moral crisis as the casino backdrop. Then a hostile silhouette of a shot gun emerges from the bottom of the right hand screen and distracts the audience. The significance here lies in the potential of the perception image, out of field and in a space out of the frame where the rabbit escapes to in some Cypriot rural landscape, pursued by the shot gun and the sound of barking dogs. As the sound image remains outside of the cinematic space, it undertakes a radical function in resisting official narratives and in constructing meaning through a duration and presence which rarifies the frame in its own favour. The text closes by repeating its initial predicament of space. ‘Rabbits have no Memory ‘anticipates the sound image which is underscored in ‘Grade IV: I do not forget’ and corresponds closely to the status it is given in Cinema 2. In the transition Deleuze cites, with the dispersal of cinematic elements and the diminished function of motor-sensory action, optical and sound images are separated. Sound is now assigned an autonomous status. Where sound images played subordinate roles within saturated movement images, Lapithi deterritorializes the movement image through the depth of field, because sound is relocated from outside of the frame, and invited to enter the cinematic space. As we read across both texts Lapithi’s antagonism towards a collective amnesia extends to her disdain of collective memory, which she presents as fenced in by a rigid pedagogical practice. Subversively, her text plays on the notion of space- inside/ outside, opened up by the music which the boy listens to and is shared with the spectactor (outside the frame). In other words, the school boy and the audience can share the same interior time. We should consider the effect of Lapithi’s combined message in these two texts. Within the parameters of ‘not forgetting’, is a pre-determined past, a national history which the individual memory must be subordinated to. It is not in Deleuze’s terms the ‘sheets of the past’ which open up an interior landscape. Deleuze’s image of the crystal, refers to gaps with circuits of time, which do not extend forward, but which allow individual images to be realized. The context to this piece is a response to the role of education in nurturing a particular national identity which positions itself within time and history. The translation of the Greek in the title to ‘I do not forget’ implies a loyalty to the past – I do not forget the suffering of the war of ’74- and this will determine how I apprehend the future and live in the present. But the irony which Lapithi draws our attention to, exists in the way in which this ‘memory’ lies outside the time of the generation/s which must ‘not forget it’. In Deleuzian terms it is not a sheet of the past of (their) individual memory , it is second hand. Also, in Deleuzian language, in the transition to the time image the subject becomes interior to time . A national collective memory such as the one constructed in the school system belongs to public time which belongs outside. There is unassailably an irony in the statement ‘I do not forget’. Lapithi also tests out and manifests the problematic of nation building and national identity because of this difficulty of collective memory . Through the education system we have institutionalized recollection which must follow a linear national history, a causality which is captured in the rhetoric of the schoolroom. In other words time extends forward to become in Bergsonian terms ‘the present which passes’. In Bhabha’s explanation, this constitutes the pedagogical cultural practice which sustains an official history of the nation. By contrast, a performative time and cultural practice enables the subject to inhabit time, to be internal to it. (Deleuze) The boy who is being punished after school here does not inhabit a performative time but attempts to create this inside time and space when he listens to his music (the lyrics of which add further irony)- ‘If I had been here before, I’d know what to do’. Lapithi begins with her distinct blank and black screen and accents throughout this work the possibilities and impossibilities of constructing narratives as the focus turns to the image of a school boy writing. Added to the space of a classroom is the blank space of the school notebook which each pupil receives during their elementary school years in Cyprus. Its slogan reads: ‘I do not forget’. The dilemma of writing the nation’s past and constructing a narrative is revealed as an ideological and cultural paralysis, and the consequenceof over three decades of post war destruction. Lapithi sets up an almost hysterical premise which she describes as surreal in another work and one which refers to the Greek Cypriot people’s proximity to Turkey and to the Turkish troops stationed in the north. ‘Good neighbours make good fences’ is underscored alongside the other central slogan ‘I will love my neighbour’. The next frame sets up a point of view suggested by the panning shot of the corridor and the movement of the camera through this corridor and into the space behind the door. The panning continues to reveal a classroom and desks before focusing on a boy sitting at a school desk. What this camera movement creates as it pans through the corridor and enters the space of the classroom is the possibility to speak of the inside and outside of the frame. The silence is broken, as the boy sitting at the desk puts on his headphones . As the spectator observes him diligently carrying out his after-school punishment we are drawn to the notion that he has space to fill represented by the empty sheets in his notebook. We have close-up shots of his hand filling in the empty pages with his writing, as he repeats the official pedagogical discourse which is part of his education in ethnicity and national identity (Bryant 2004). The school room is the territory where national history is taught and repeated, so that the lessons of history extend and engulf the time of the nation in the present and in the future. When the headphones are worn and sound fills the frame, Lapithi destabilizes pedagogical culture and time by allowing sound to take the place of the optical image. As the sound saturates an otherwise decomposed set, Lapithi makes the collective discourse and the boy’s task appear absurd on the strength of a fullness and expansion which sound creates. The significance of the composition at the end, where the pencil and rubber are laid down beside the filled notebook, with the headphones over the top, is to indicate possibility of erasing what has been written. And this eradication is empowering and triumphant at the end of the text. In Electricity Lapithi empties the frame of all moving images and pure time at a visual level emerges for itself sustained on the presence created by the sound image. Such compression diverts our attention from a frame full of distractions to establish the autonomy and dominance of sound derived from outside of the frame. Sound infiltrates a blank screen. It is the distant sound of a radio broadcast from CyBC radio when Cyprus was occupied in August 1974. Then the sound of bouzouki music emerges. This lends a clear Greek Cypriot presence to the image as the intertitles emerge. Immediately, irrational cuts jump to the mountain range in Cyprus known as the Pendathaktylos- the ‘five fingered mountain top’ now in the occupied northern half of the island. The physical landscape is prominent in many forms of Greek Cypriot art and it takes on human-like qualities through personification. The mountain range occupies the screen horizontally and emerges at our eye level. We see that it is a picturesque almost postcard image of blue skies . Now we see the Turkish flag (of mainland Turkey) and the music switches rhythm and pace- but it is still Greek Cypriot music. Music enables Lapithi to initiate a response to the presence of Turkey in Cyprus, by shifting the rhythm of the Greek Cypriot music. Moving these cinematic elements around symbolizes the loss of the mountain range to the population who lived in the South of the island. After the division of land and population in 1974 Pedathaktylos was not accessible to the Greek Cypriot population. Now the Turkish flag is seen to move, we see that it is diminished in size as it is relocated from the centre of the frame to the right of our screen before there is a cut to a map of Cyprus indicating different locations. And now the alteration in the music precipitates a sense of movement and change as the image of the island is in extreme close up and the map displaces the Turkish flag. We then switch to an electricity station with the notice ‘authority of Cyprus’. Again note that we are confronted with stillness not movement in this image and as we fix our attention, it is to the audio rather than the visual elements that we are drawn. As the camera cuts to track across the station we hear the sound of electricity being generated with text above our eye level presenting historical facts. This text is represented inside the image whilst the sound is ‘out of field’. It underscores the relevance of sound to the time image in the transition from Cinema 1 to Cinema 2 and simultaneously captures the dismantling of the cinematic parts in this process to create the notion of an inside and outside which is crucial to this text. We can hear faint and distant human voices but these do materialize into more. Even though a figure is seen on the bottom left side of the screen it disappears swiftly. Again the landscape removes the human subject and captures a presence – through electricity, entirely through that which is heard. We now link this movement of electric currents to the message accompanying this text which explains the bizarre fact that this electricity is consumed by the Turkish troops stationed in the north of Cyprus, who are there to create a military presence and to be hostile; and as part of this, they use the electricity sourced by Greek Cypriots in the south, to light up the Turkish flag every night at 8pm. We learn from her website that this is the largest flag in the world consisting of 1000 m and when it is lit every night it flashes ‘so happy to be a Turk’. This text is about this disbelief which involves every Greek Cypriot on a daily basis in some kind of game of charades. This sentiment generates a change within the frame as the sky becomes opaque and out of focus, it is not the same as the initial harmonious landscape. It is dull and not blue, with a faint identification of the Turkish flag in long shot. As the screen becomes darker there is a gradual definition of the Turkish flag being delineated in the middle of the screen. The audience hears Ottoman music first, then lyrics sung to this tune. The Ottoman music is precise and triumphant as the voices emerge along to it. Finally the black/ blank screen takes over . Lapithi has taken the time image and preserved it on the screen through a rarefication of her frame, which is overbalanced by a saturated sound image . Through sound she recomposes an alternative national history and identity amongst the layers of her text which she stratifies through her choice of music; the selection of which comes to bring an alternative narrative of the Cypriot nation whilst simultaneously it becomes her sole narrative strategy, outside of the linear form offered by the movement – image. In cases such as this, Deleuze’s time-image presents the scope to isolate layers of national history and to destabilize and de-familiarise national identity and a national past based on linearity. Liapiths’ strategy is to dispense not only with the action-image but the affection image too and to vacant her frame if only to overcompensate it through a saturated sound image. Much is condensed in this text as Lapithi takes the possibilities of the sound image further than Deleuze developed. I would like to term the images in her work as defined by a ‘sound-narrative’ because she ungrounds the notion of narrative at various levels but constructs the meaning both within her frame and from shot to shot by preserving time and then filling the Deleuzian ‘crystals’ with sound. Her means of bringing these to the surface of her text is essentially through sound because the ‘sheets of the past’ are confronted with the present; but not in straight line as Martin Jones (2006) identified, but within the labyrinth (Martin –Jones) or crystal. If the time-image is about creating an expansion of time made possible by the circuits around the image, rather than an extension forward such as in the movement image, Electricity expands Cypriot history and time as they are excavated and realigned to suggest how they coexist concurrently in relation to the present. Finally, I want to say a little more about the historical values attached to the choices of music by means of indicating how narrative-sound begins to represent both time and history. The initial choice of bouzouki Greek music brings to the text’s surface the Greek Cypriot and also the Hellenic historical tradition and evokes this history of the island. The Ottoman presence on the island arrived in 1571 with the invasion of the Turkish sultan who took over the island from the Venetians and held onto it until the British in 1878. The reference to the Ottoman presence has a new historical reference now because the Turkish settlers in the post 1571 period became Turkish Cypriots who assimilated into the life of the island. The interference of mainland Turkey in the developments of the new Cypriot Republic as a nascent modern state is marked by the appearance of the Turkish flag in the text. The two distinct periods of history alluded to are first of 1963 when the relative bi-communal peace was broken between the Greek and Turkish Cypriots with violent riots in the capital. This led to a division of the capital Nicosia and the onset of hostilities, provoked further by Turkey’s readiness to land on the island to protect the Turkish Cypriot minority. As Panteli (1990) informs us the Turkish troops which arrived on the island during this incident, are there to-date. Hence, the second defined date which is implicit is 1974 which ultimately saw an increased show of Turkish soldiers in the north. Lapithis’ head on confrontation with the politics focuses her audience on the questions of national territory and space as she centres and de-centres the maps and flags – codes and signs of national identity and nationalism before us. Lapithi’s seemingly random cinematic construction which is dense and abstract comes to form a precise composition which is all about the historical claims to the island’s origins and its ever evolving national identity and ethnicity. The ‘narrative’ presents the contesting versions of history, be they in a Hellenic past, a beginning in 1571 or arguably a new departure for ethnic relations and identities brought on by events in 1963. If we come back to the historical transformation suggested by Deleuze , as the moment of transition, 1974 has unearthed all these layers and strata within Cypriot society which in our filmic and cultural terms translate into Bhabha’s double time concealing hidden histories (1994). In this sense Laura U Marks’s language in The Skin of the Film: Intercultural Cinema, Embodiment, and the Senses (2000) of the geological layers of experience and history requiring excavation, works with the notion of a time which needs to be recouped. In Electricity, Lapithi excavates the nation’s past as she resists filling the gaps with movement. She offers the time-image in her ‘narrative sound’. · I would like to know what the audience thinks about the various historical transformations that have taken place recently in other parts of the world and what impact they will have on emerging cinematic trends. Will these precipitate new time- images? · To take this a step further, let us consider how Hollywood and American cinema shows a lack of national confidence and understanding of ‘national’ unity and identity through an increasing trend for time-images and recollection. The point to note is that ‘1974’ is the political and historical context, but the generation of filmmakers I am focusing on emerged in the last decade. In other words these filmmakers were just born in 1974 or they were very young and it is likely that their cinematic response to ‘1974’ as a political and historical event draws on the memories of those around them; the unresolved and ongoing political situation in Cyprus and the historical and political events during their own lifetime living in Cyprus, or living as Greek Cypriots outside of Cyprus. Gilles Deleuze Cinema 1: The Movement Image (Paris: Les Editions de Minuit, 1983), Trans. by Hugh Tomlinson and Barbara Habberjam (Minneapolis: University of Minnesota Press, 1986) and Gilles Deleuze Cinema 2: The Time Image (Paris: Les Editions de Minuit, 1986) Trans by (Minneapolis: University of Minnesota Press, 1989). I will refer to these texts here on as Cinema 1 and Cinema 2. See the statement on her website which provides some background information to this work. The references at the centre of this piece come from the novel by Lawrence Durrell’s Bitter Lemons (1957). Lawrence spent time in Cyprus during the colonial decade of the 1950s as a but in Liapithis’s view probably also as an undercover British spy.